If you would like to view this slideshow on an iPad, please click here. Rachel Nackman: When did you start making the desktop drawings? Winston Roeth: I have always drawn, but the desktop drawings became a more formal practice when I started making them on graph paper in the mid- to late 1980s. Around that time I was beginning to receive the kind of financial support that I needed in order to be more active in the studio. I was spending more time at my desk—more time thinking about what I was doing and what I could be doing—and the desktop drawings became a good conduit through which to organize my thoughts. RN: How did you decide to start using graph paper? WR: To me, the graph paper provided a nice way to measure space in my mind. By using the increments of the printed grid, I could establish scale and get an understanding of how something might look in space. I could also play around with the grid of the graph paper as a formal element, which was mirrored in some of the drawings and paintings. Altogether, the graph paper provided a neat, compact way of thinking out loud on the page. And I liked the notion that the grid was there before me and would be there after me; I find that very nourishing. RN: Is that sense of continuity one of the things that attract you to graph paper? WR: Yes. The grid is a constant with which I can work directly. It can be contained within itself, but it can also express something that extends beyond the borders of the page. RN: Did you initially begin making these drawings with specific paintings in mind? Or were they just one part of your larger studio practice? WR: In the beginning I was just noodling around, trying to figure out proportions within paintings. The desktop drawings were never so directly correlated that one drawing referred to one painting. All these drawings have a kind of flux to them; they keep flowing back and forth. Sometimes I make these drawings over and over, with little increments of change here and there, so that ultimately the ideas begin to pull together, and then I have a record of all this thinking. When I decided to focus on gathering together all the desktop drawings, I tried to retrieve whatever I had squirreled away in boxes here and there. When I left Manhattan and moved up to Beacon many years ago, I had put a lot of things away in storage. I started to pull out these desktop drawings and organize them—trying to date them correctly and put them into a kind of timeline. I began to realize that these drawings are an interesting record of my work over a certain period of time. RN: The earliest one that Wynn has is from 1990. WR: Yes. Around that time I started to find significant support for my work, and my mind was really trying to grow in many different directions at once. I was inspired. The earliest desktop drawings were made freehand, and then as I started to become more focused in the late 1990s, a bit more discerning, I used a ruler. RN: How do you think the desktop drawings fit into your overall practice? How do you use them while you’re working on your paintings? WR: The desktop drawings have changed over the years, but I would say that they serve primarily as a backdrop. They’re like the rudder of a boat as it moves through the water. The way I have worked for many years is in many separate currents of painting; the drawings allow me immediate access, across currents, to all areas of my work. For example, if I’m working on some grid paintings and I get a bit tired of working within such a rigid system, I can use the desktop drawings to take a turn toward more open color. Often the desktop drawings help my thoughts drift off into whatever direction I want to go. RN: Do you use the desktop drawings throughout the process of making a painting, before, or after? WR: It’s not a formally regulated system; I would simply say that I’m always making them. RN: When you’re making a desktop drawing today, are you ever conscious of the fact that it relates to one particular painting? Or are the drawings more atmospheric? WR: Atmospheric is a good way to put it, yes. Then again, they can occasionally be quite specific. If I’m working on something and I need to find a little advice on what I’m doing, making a desktop drawing sometimes gives me just the push or the focus that I need to take it to the next level. RN: When you make a desktop drawing in direct relation to a painting that you’re making, do you use the drawing as a compositional tool? Or do you use it to make color choices? WR: I use the drawing primarily as a compositional tool, especially when I’m organizing a grid, which presents so many variables within such a simple form. I can measure out a painting in front of my eyes using a desktop drawing. All kinds of decisions can be quickly accessed and made. I might make a few notes on the margins of the drawing about colors that I have in mind. Sometimes I change to a colored pen, just to play around with how color might change the image, but those colored inks are specific to the drawings and don’t travel into the paintings. The desktop drawings are basically black, blue, and red ink; the paintings have much more complicated color. I did find that in some of the desktop drawings, if I worked the ink into the paper over and over again, I’d start to achieve some of the material aspects that are interesting in the paintings, like a little sheen on the surface that allows the color to shift slightly. RN: Some of your desktop drawings are oriented horizontally and some vertically. Some of them have more marginal space than others. But in none of these drawings does the image take up the entire sheet. WR: No, the drawings are always set within some kind of space. Oftentimes you’ll see a line that runs across the bottom of the sheet, like a baseboard, where the wall meets the floor. I use some desktop drawings to play around with particular arrangements of forms in space. In some of them, I was preparing for a show that I had at the Eric Stark Gallery on Crosby Street in 1997. RN: In the drawings relating to the Stark Gallery installation, there is a fair amount of architectural detailing included. WR: It was such a challenging space that I wanted to think through the whole exhibition as best I could. I literally used the gridded paper to reconstruct the walls of the space and to test hanging the paintings within them. A lot of the drawings have to do with where certain works are going to hang in a gallery. Making a drawing often helps me to deconstruct the complexity of an installation, to find the nugget of what I’m trying to achieve. I also use the desktop drawings to do a lot of exploring. They’re not the works themselves; they’re just drawings for the works or, more simply, drawings of ideas. If I went through all the desktop drawings, I would say that most of them were never realized. They’re just possibilities. They’re the same ideas that I have always had—similar ideas run through my career. The desktop drawings give me a sense of where those ideas have navigated. Titles surface that never were attached to paintings; if I still like the titles, I may want to use them. The same thing goes for proportions, placement. As I move from one group of works to the next, the drawings are right there for me to use. RN: How do you prepare yourself to make a desktop drawing? WR: Well, I just take out my pad of paper and get a pen. It’s not very formal. I don’t have to prepare myself to do it. It just happens. RN: Do you ever throw any of them away? WR: Well, sometimes my hand slips or coffee spills . . .
RN: But are there ever drawings that you just don’t like? WR: This is the one format in which I don’t have to worry about liking or not liking something. If I keep a drawing that I don’t love, it’s just a part of a body of work. They’re not that important individually. RN: You occasionally make desktop drawings in preparation for a certain exhibition in a certain space. How do you use those drawings when you’re installing? WR: My first time installing in a gallery, I usually walk in cold and think, “What are we going to do here?” After I’ve learned the space and seen it a few times, then I begin to imagine the works within that setting and to make drawings. RN: Do you ever bring a desktop drawing with you to a gallery to aid in the actual installation process? WR: Well, sometimes I will fax one to the gallery to let them know what works are coming. Or I’ll fax one to the people packing the work for transit, so that they can keep track of what goes into each box. That sort of inventoried list or sketch—made by hand—is probably going to become less relevant in the future because of the computer. RN: Do you think you would ever make a desktop drawing on a computer? WR: No, I don’t think so. It’s handier to work on a drawing pad right in front of me, and I like that practice. It’s much more private. RN: In the group of drawings we’ve selected, we can see many titles underneath the images, like captions. Some titles recur, and some never show up more than once. How do you use your desktop drawings to make determinations about titles? WR: A title might be really clear in my mind as something I’d like to use, so I’ll use the drawings to work out which painting it belongs to. Some of the drawings are just inventories of extant works, so in that case the little sketches already have titles attached to them. RN: One of the drawings has a list down the side of titles that you may have been thinking of at the time, but they’re not attached to any particular image in the drawing. WR: That’s something else, aside from the drawing: I make lists on paper of titles that are looking for a home. They’re floating around in my head. Sometimes one seems right for a particular work. 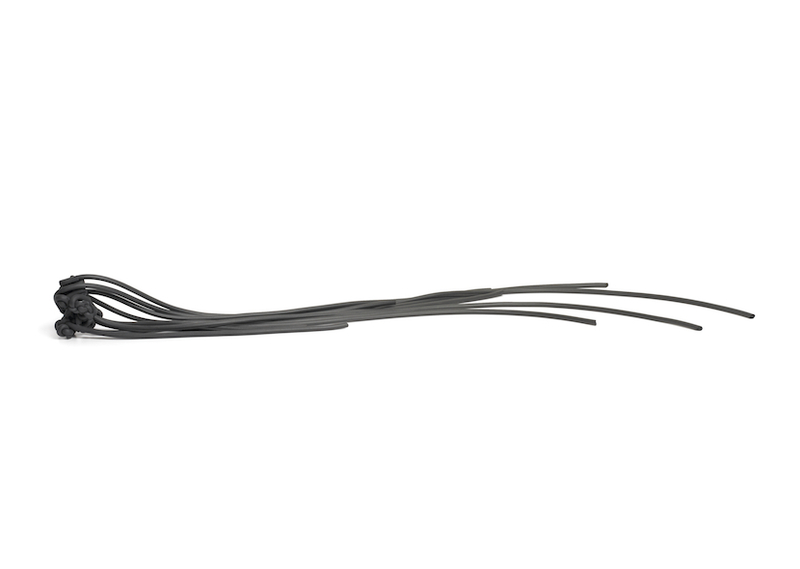 That’s what I like about the desktop drawings: things just float in and reveal themselves. Sometimes that’s all they need to do. RN: Some of the drawings have dimensions written on them, and some do not. Are these different types of drawings, or do you make them at different points in your process? WR: The drawings that indicate dimensions are usually linked to physical paintings. In those cases, I would have been using the drawings to make decisions about the painting’s scale. 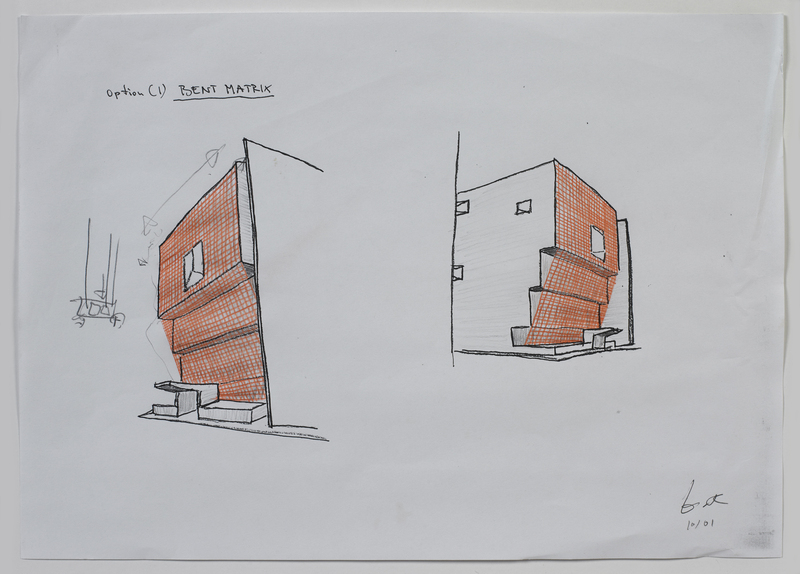 RN: How would you feel about showing one of these drawings alongside the finished painting to which it corresponds? Would that be antithetical to what a desktop drawing actually is? Winston Roeth (b. 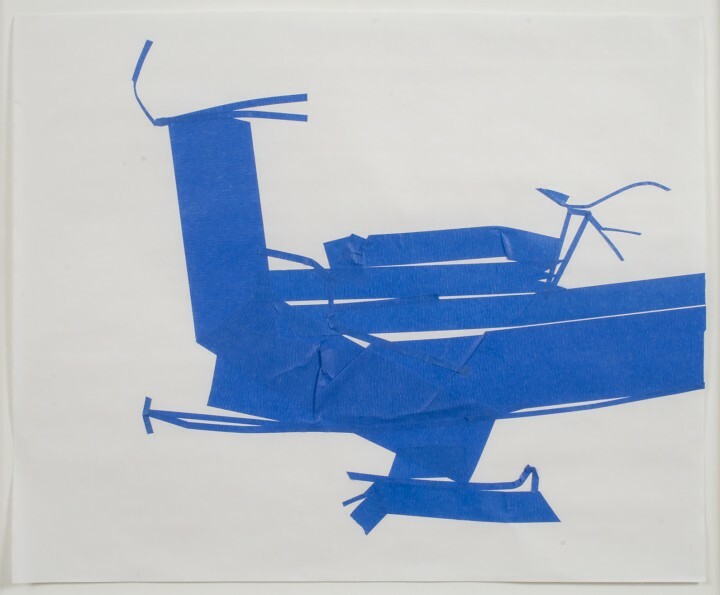 1945, Chicago, Illinois) has had his most recent solo exhibitions held at Pablo’s Birthday, New York (2008); Andrew Jensen Gallery, Auckland, New Zealand (2009, 2011); Xavier Fiol Gallery, Palma de Mallorca, Spain (2010); Ingleby Gallery, Edinburgh, United Kingdom (2011); Galeria Peter Zimmerman, Mannheim, Germany (2012); Charlotte Jackson Fine Art, Santa Fe, New Mexico (2012); and Bartha Contemporary, London (2012). His most recent group exhibitions have been held at the Colby Museum of Art, Waterville, Maine (2008); Jensen Gallery, Auckland, New Zealand (2008, 2010); Dorsky Gallery, Long Island City, New York (2009); Howard Yezerski Gallery, Boston (2010); Sammlung Schroth, Soest, Germany (2011); Albright-Knox Art Gallery, Buffalo, New York (2011); Bartha Contemporary, London, United Kingdom (2012); Olschewski + Behm, Frankfurt, Germany (2012); and Margaret Thatcher Projects, New York (2012). In 2013 Roeth’s work will be shown at Xavier Fiol Galeria, Palma de Mallorca, Spain and Jensen Gallery, Sydney, Australia. Roeth lives and works in Beacon, New York. Rachel Nackman: How does drawing figure in the entirety of your work? 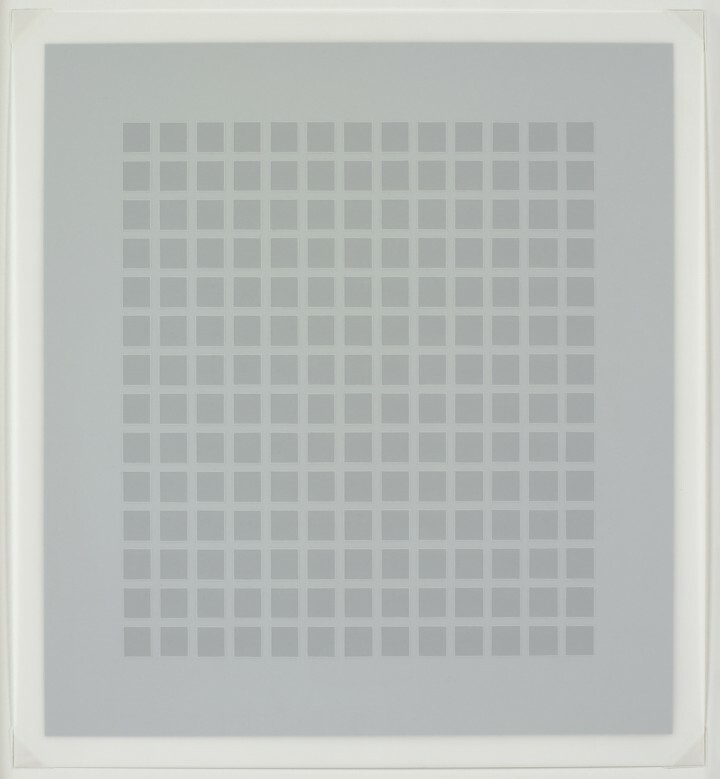 Erwin Redl: There are two ways that drawing fits into my work. First, it can function purely as an engineering tool; second, it serves as an artistic expression. Then there’s everything in between. 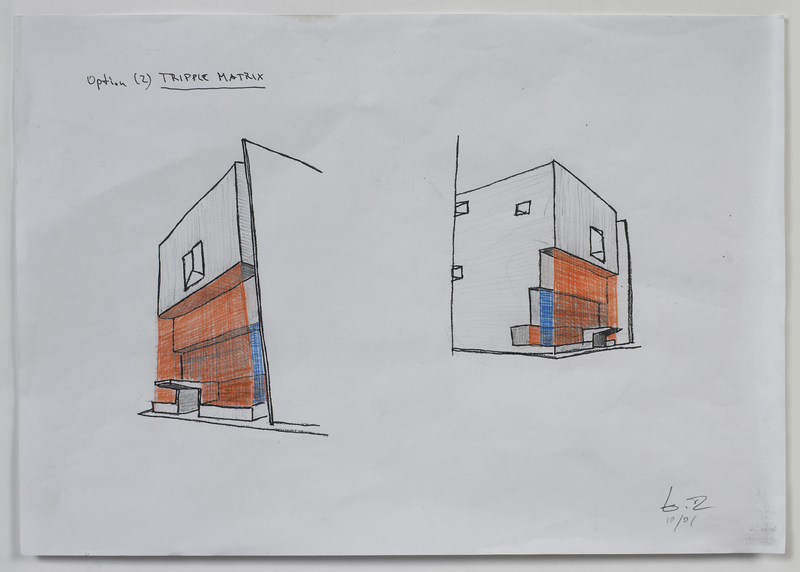 RN: This series of drawings was made in 2001 as part of your proposal to the Whitney Museum for its 2002 Biennial. The project ultimately realized was a light installation on the façade of the Marcel Breuer building. ER: Engineering is a very creative trade. These drawings were made on paper, but now much of the engineering work is done on the computer. Very often we don’t even print it out anymore. Going back to 2001, everything was done by hand. My technician and I would sit with two pencils and draw on the same drawing. The artistic part was solely in my corner, but when it comes to figuring out how you should work in the real world, with real problems, the plans are made collaboratively. In 2001 the visualization process was almost exclusively completed by hand. Even though much of the work is done on computers today, I continue to sketch ideas for myself by hand because I love the gestures. It’s good to have a corporeal step between the idea and its realization in the three-dimensional world, and that step is made by hand. There’s a whole group of artists and engineers that I call “pixel pushers.” They don’t have any idea about gravity or mass or volume, because for them those concepts are just pixels on their screen. I grew up in a workshop with my father, who was a furniture maker. For me, everything was about mass. As a kid I grabbed stuff intuitively and learned by osmosis—not in an abstract way, like with a pixel. It’s very different now. I’m not saying it’s better or worse. It’s just a different concept of reality. RN: Can you tell by looking at these drawings at what point in the development of the piece they were made? Were there other drawings made before these? ER: These drawings showed different versions of what I could do. Larry Rinder, the curator at the Whitney, saw my piece MATRIX IV in the Brooklyn Bridge Anchorage as part of Creative Time’s project Massless Medium: Explorations in Sensory Immersion in 2001. He asked me to do something for the Biennial. In preparing for this piece, I had to tell them what I wanted to do and think carefully about how it could be done, because we were dealing with the Marcel Breuer building. It’s a landmark; you can’t drill into the façade. It was a long process—between an idea, the rehearsal of the idea, and then what you actually do. Most of the time the idea process is very quick. I don’t fuss around too much, especially at the scale of these drawings. The ideas are mostly spontaneous. If I go to look at the space while working on a proposal, it usually just happens. How it happens goes with the experience—seeing how it influences you. Then you have to present the idea to yourself, because at first it’s just in your headspace. Get it out and look at it. How does this actually look? Not just in your head but on real material, in a drawing. RN: Is that process like a translation? ER: It’s just like a translation. You have an idea about something you want to do, and then you have to explain it to somebody else. The older you get, the more experienced you get in translating whatever drives you, in presenting your ideas to the rest of the universe. A drawing for this type of work is the translation of an idea that becomes something else later on. I make other works that are a whole different type of drawing. They are out there on their own terms, and they make no reference to anything else. But of course they’re made by the same person, and they employ similar principles. RN: Once these drawings were presented to Larry Rinder and you had made a collaborative decision about what would be installed, what happened to the drawings? Were they used in the installation? ER: Not really. The engineer needs to get an idea of what the piece should look like, so that he or she can visualize the end result in terms of the engineering. We try to further translate the idea so that it can actually be realized. RN: So from these preliminary conceptual drawings, you had to move into a completely separate set of drawings. ER: Yes, and at that point it was all done by hand. We managed to do it, and nothing fell on anybody’s head, which is good. With this work, I wasn’t trying to modify architecture. The Breuer building is there, and I put something else there that is on equal terms. The architecture creates a spatial event or tension. My piece is not there to counter it; it’s just there to grab what’s underneath and present it, like an invisible force in space. I’m plumbing space; that’s my job. The space already has the tension. I find those invisible points of tension and squeeze them a little bit, and then the space becomes physically different. RN: Today, in 2012, do you still make drawings like this as part of your working process? ER: Yes, I still make drawings like this, but the process has changed a lot. You don’t give a drawing to someone as a proposal anymore; you send a PowerPoint or you send a PDF. But even so, I scan drawings. RN: Drawing still has to be the way you get to the next steps? ER: Among other things. I like drawing by hand, because then I feel more connected to the project than I do making a 3-D model on the computer. But some people can’t even express themselves that well on paper anymore. Today you can download a software program, and suddenly you have your idea in 3-D. Everything is done very quickly. RN: After realizing this installation at the Whitney Biennial, how do you feel about these drawings being shown as artworks in an exhibition? ER: They will always be shown in the context of the installation, because they’re representational, and I don’t make representational art. 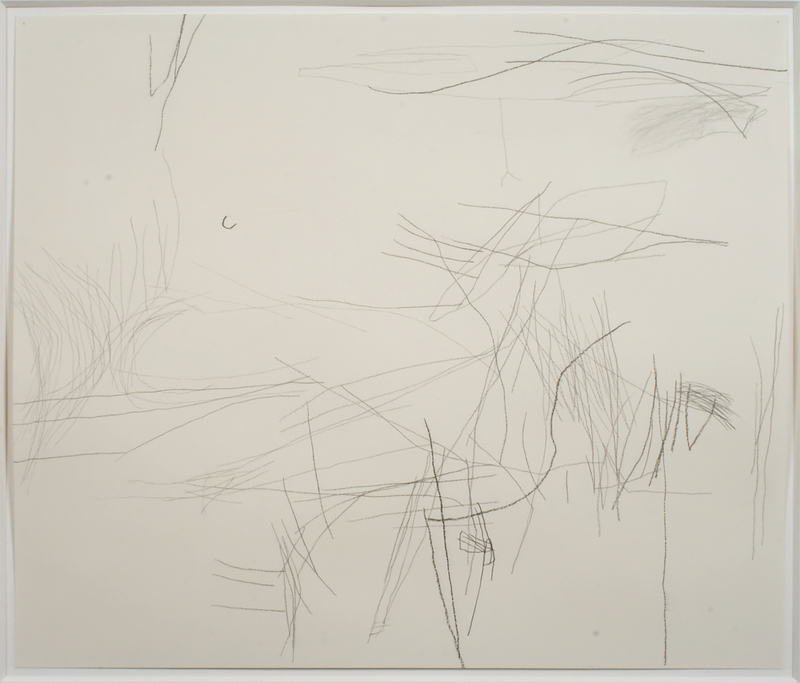 These drawings represent the piece I made at the Whitney. Viewers will know that these drawings were not meant to stand on their own feet, like an abstract drawing is meant to do. RN: Can you tell us about the drawings that you make as finished works, which have no relation to your light installations? ER: Well, those drawings are purely flat, and most of them are monochromatic. They’re based on very simple grid systems, but within each system there are small individual gestures. I use that type of drawing to embrace Minimalism. That’s what it is, and that’s why I’m interested in it. RN: Do you ever think about your abstract drawings while you’re making light installations? ER: Oh, yes. They come out of the same mold, and they influence each other radically. I sketch something by hand, and I might take that idea and turn it into an independent drawing, or it might work for an installation—or both, or neither. I trust my intuition. RN: Notations includes drawings by Fred Sandback and Dan Flavin, both of whom made finished drawings and proposals for installations. Do you have a relationship with either artist’s work? ER: Fred Sandback changed my life—that’s my relationship to Mr. Sandback. Before I saw his work in person, I had seen it in some exhibition catalogs. In 1997, when I was in the residency program at PS1, I was focused on computer installations that were either projected or on a screen. At the Dia Center in Chelsea there was a Fred Sandback exhibition, and when I saw it, I was completely knocked dead. The next day I went back to my studio, I packed away my computers, and I made my first light installation. It was a 360-degree difference. For me, what Sandback did was exactly what I had always wanted to do. I was interested in abstraction—but corporeal abstraction, in a purely spatial way. It doesn’t get much more minimal than Sandback. It’s a very geometric, clear, delineated feeling that his work provides, and that was a complete knockout for me. I was blown away. Dan Flavin was influential in a different way. Of course he also used lights; that’s by default very close to what I do. But the early Flavin was a sculptor. He used fluorescence like a sculptor would, making works with three-dimensional mass. Those works also involve time. How much time do you spend in the space so that your eye adjusts to the light? How much time does it take to traverse the space so that your perception changes? RN: Your first and most affecting experiences with both Sandback and Flavin were with their sculpture. RN: How do you feel about their drawing practices? ER: I can’t separate their drawing from their sculpture. You see it, and you cannot erase your memory—it is all related to that formative experience. When you experience that work, it is with the whole body. I get the same goose bumps—the same corporeal goose bumps—seeing their drawings. I don’t make a distinction. In talking about drawings, Sol LeWitt is another very big influence. His wall drawings have had an enormous influence on my work. Those drawings give me the same goose bumps. 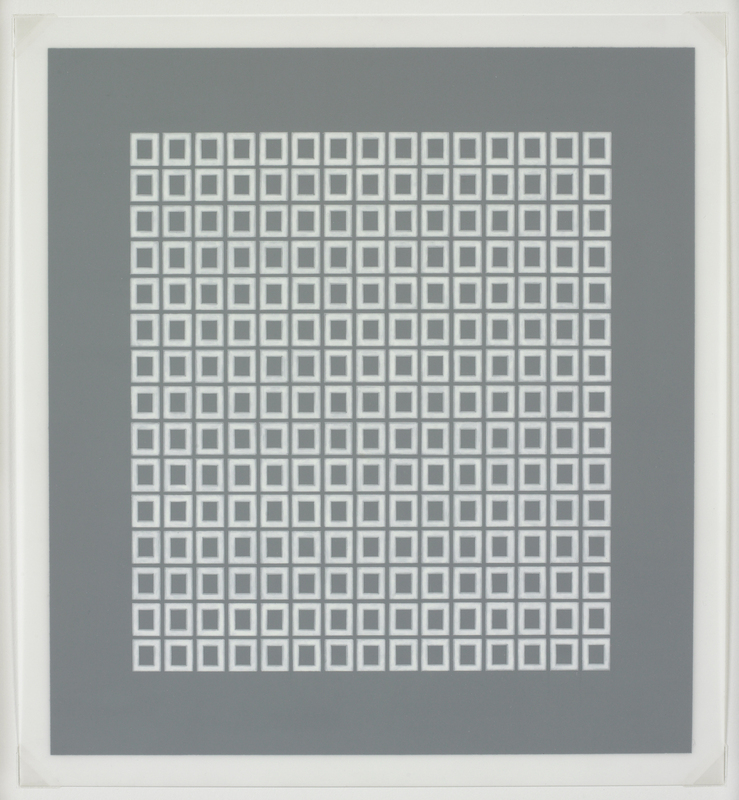 LeWitt’s space is completely structured—tightly and very narrowly structured—but infinite at the same time. I don’t think it’s a retinal experience so much as a whole-body experience. RN: It doesn’t matter what the medium is? ER: It really doesn’t matter. RN: In your work, however, there’s a difference between looking at your drawings and looking at a light installation. So the medium creates certain specificities? ER: Oh yes. For me, it’s completely different. I try to be accomplished in the medium itself. If I want to draw, I want to take the time to become a good draftsman. And it’s the same with light installations: you have to know a lot of engineering to express your ideas. That’s it; the rest is just about the idea, which is abstract. In my case the idea is abstract in that it’s not representational—but not abstract in that it’s not corporeal. It’s always corporeal for me. Erwin Redl (b. 1963, Gföhl, Austria) studied at the Vienna Music Academy with a BA in Composition (1990) and BA in Electronic Music (1991). In 1993 he was awarded a Fulbright Scholarship for graduate studies in computer art at the School of Visual Arts, New York, NY (MFA 1995). The artist lived in New York from 1993-2007 and moved to rural Ohio in 2007. Erwin Redl participated in several major art residencies, including in 2003 at the Chinati Foundation, Marfa, TX and in 1997-98 at MoMA PS1, Long Island City, NY. The artist’s work was featured in the 2002 Whitney Biennial, covering the Whitney Museum of American Arts’s facade with a three multi-color LED veils. In 2008 Erwin Redl created a sound and light installation for the Austrian Pavilion at the World Expo in Zaragoza, Spain. The Pacific Design Center’s new Red Building by Cesar Pelli will feature four permanent installations by the artist to be completed in 2012. Erwin Redl’s largest work to date is a computer-controlled 580 ft long outdoor LED-installation at the Wexner Center for the Arts in Columbus, OH completed in November 2010. In 2010 he won two major public art competitions with installations for the new New York Police Academy in Queens, NY and the Union Square / Market Street subway station in San Francisco, CA. His work is collected by national and international institutions, among them the Whitney Museum of American Art, New York, the Museum of Contemporary Art San Diego and the Milwaukee Art Museum. Rachel Nackman: Seriality has been a very important part of your work for many years. Can you tell us a little bit about the history of that part of your practice? Jill O’Bryan: I started out as a painter. First, out in the landscape, learning how to see, and then later the paintings became an immersion in the process and the pigments—pushing paint, as it were. This was an intuitive, sensual process, and I was really in love with it. My relationship to art making changed when I began studying philosophy and contemporary art theory. I became intrigued with the notion of truth as a variable—for example, linguistically, that there exists a slippage of meaning between the signifier and the signified, which makes it impossible to accurately represent the self. I experienced these ideas as beautiful and powerful poetries of complexity, and I used them as a schematic to write a book about the artist Orlan as my doctoral dissertation, hypothesizing that her continuously shifting identity was a radical political means to undermine fixed perceptions of identity. During this time I started doing writing exercises with pencils, to experience language, viscerally and visually, and to feel its relationship to the body. These exercises led me to understand writing as a performed geometry, and I began a series of paintings that mimicked this movement. They were made with painted paper, ripped into small pieces and then sewn together, left to right and top to bottom. 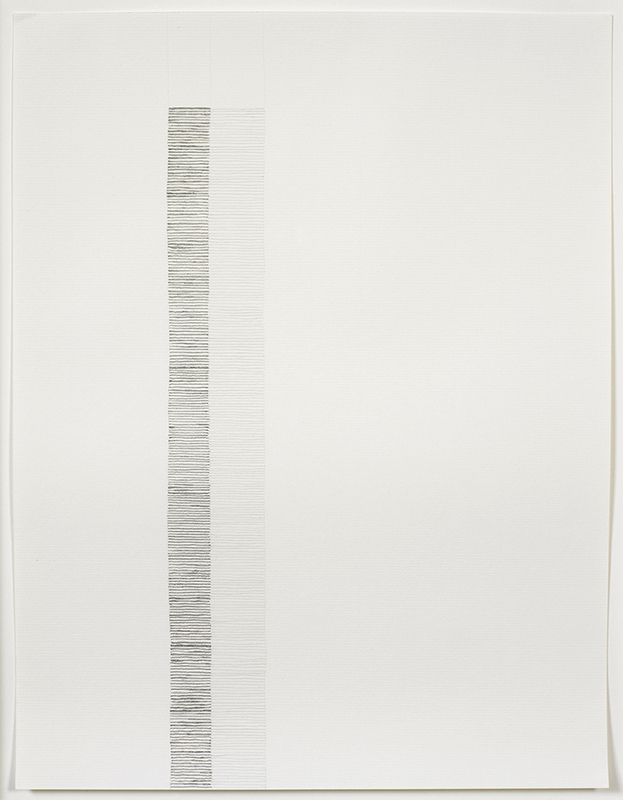 When I finally finished the PhD, I went into my studio, put up a big piece of white paper, and stared at it for weeks. I thought: “Okay, the thing that’s weighed the most heavily on me for so long has been this book. So I’ll erase my book; I’ll just go backwards.” I started making marks on that large sheet of paper—one mark on top of each imagined letter, left to right and top to bottom. I took great pleasure in approaching the book’s text letter by letter instead of word by word. It broke the text into its most minimal way of being—and nonbeing. Every day in my studio I made a few marks—for several hours or maybe just five minutes. I never thought 40,000 Breaths (2000-5; fig. 1) would become a finished drawing. It was a process, a way to be in my studio. While making it, I felt an enormous freedom that had to do with presence, with just being there with minimal materials—a pencil and a piece of paper. I discovered that this activity also had a rhythm that correlated with breathing. So I started counting my breaths as I was drawing—archiving breaths. RN: And this was the first of the Breaths drawings? RN: Yes, he likes that story. Can you tell us about the precursors to 40,000 Breaths? 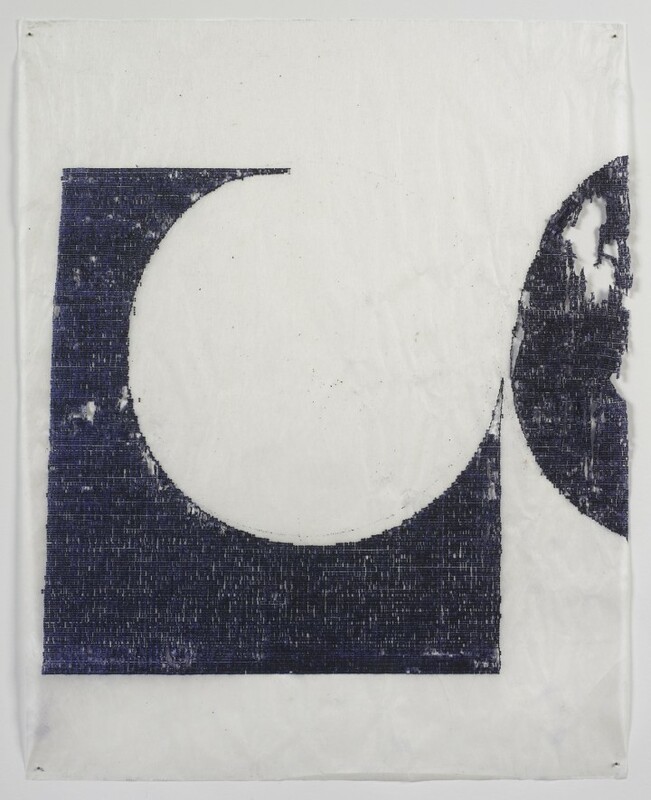 JO: They were large monochromatic paintings made by dyeing, painting, or pounding pigment into wax paper that I then ripped into small rectangles so that I could rearrange them and sew them back together again. I used glue and other types of medium. Some areas are translucent, and in other areas powdered pigment sits on the surface. I discovered an obsession with putting together lots of little things to make a large finished piece. RN: So they’re really worked objects. RN: You were working on those pieces during graduate school. Was that a sort of physical escape for you, a separate task from the theoretical work that you were also doing on a daily basis? JO: It absolutely was. The visceral activity of making paintings offset the theoretical research—it created a balance. These paintings were about seriality but also pigment and translucency. RN: Do you feel that the connection between art theory and your work as an artist really began with 40,000 Breaths? JO: Yes. I’d been having a bit of a rebellion within myself, a struggle to conceptually bring together the artwork and the writing. 40,000 Breaths was initially an imitation of the act of writing, or rather a negation of it. I was blacking it out. But I was also clearing my mind. RN: The writing exercises, which you mentioned starting while working on your dissertation, before you began 40,000 Breaths—were those notes? Words? JO: Both. With a pencil I copied passages from the texts that I was reading. A close reading, if you will, with a physical quality. This helped me understand the complex ideas that I was taking in. I guess that’s the difference between an intellectual’s approach to thinking about what they’re reading and a visual artist’s approach to it. RN: It seems almost like another form of linguistic exercise, taking what you’ve learned outside of the language in which you’ve learned it—a way to turn it around and make it something that you own. JO: I like the way you put that. It’s a quest to own the knowledge. RN: It’s so easy to think you understand something because you can repeat it in the language in which it’s written, but you may not be able to conceptualize it in your own language. JO: You’re right about that. You’ve obviously experienced this firsthand. RN: It’s interesting that those exercises preceded 40,000 Breaths, because we know that we breathe, but we don’t really know what that’s like. JO: Making it visual, archiving it, may reveal our mortality, but it’s when you can’t breathe that you understand what it is. RN: One of the things that I’ve noticed about the serial quality of your work is that each of the components you assemble does retain its own individual character. Is there a certain level of variability that is acceptable to you within one work? 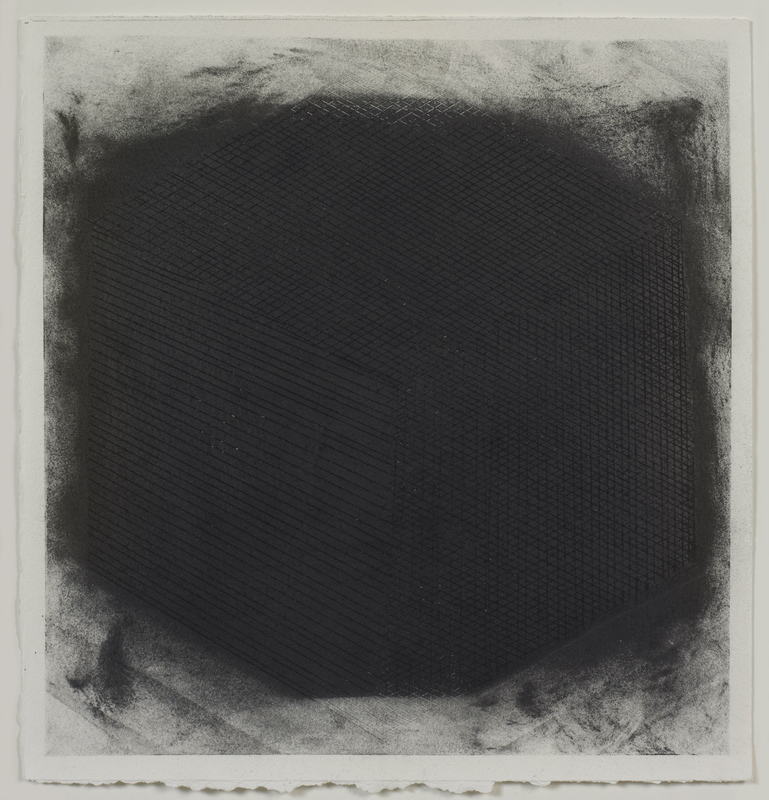 JO: In spite of the fact that each mark has its own character, there’s an overall sameness in the marks that has to be there in order for these drawings to work. I choose a small shape and repeat it until the paper is filled up. Within the drawing there’s variability in value and texture, depending on how I hold the pencil and how hard I press. I incorporate a bit of randomness by using different pencils yielding different values, but I don’t predetermine which ones I will use . . . just whichever one I pick up out of a pile. There’s a transition that happens because of the materials used. RN: The materials and your body. JO: Yes. Once I centered the work within the body, I knew I would access qualities of universal experience and interconnectivity. RN: And that universality locates itself, in part, in everyone’s being able to recognize the body-driven differentiations between the marks. JO: At first glance the most recognizable quality might be the large amount of repetition, the amount of work invested in making the drawing. Its title links it to the body and then lodges the body in time. I’ve calculated that one breathes about 630 million breaths over one hundred years. That means that most of us will never even breathe a billion breaths. RN: 40,000 Breaths took you five years to make—from 2000 to 2005. How much of a part of your day was this drawing? And when did it fit into your practice—as an artist but also as a person? JO: I worked on it for a couple of months and then didn’t touch it for a couple of years, although it was always hanging in my studio. I would go to it when I was blocked, while in between pieces, when I felt lost or upset. I discovered that working on this drawing was very calming, and the process became a meditation. It became a part of my life. RN: It’s a constant activity, and it’s a touchstone. RN: Did you begin other Breaths drawings while you were working on 40,000? JO: I started several. A few were successful, but I threw some away. RN: What made those drawings unsuccessful? JO: They felt contrived. I realized that I had to finish the first one in order to move on to the next. I can have only one going at a time. RN: Because you have a relationship with the drawing? RN: It sounds like a demanding relationship but also a really supportive one. JO: Well I can’t have an affair on the side. [Laughter.] I can make only one Breaths drawing at a time. I did have a relationship with 40,000. It wasn’t like I could’ve just finished it tomorrow. We had a thing going on. RN: It’s such an involved and intimate process that if you don’t enjoy it I can’t imagine that you’d want to keep working on a particular drawing. JO: Sometimes they’re problem children. Sometimes I have to force myself to work on them. RN: When you start to make a Breaths drawing, what goals do you set? Are you looking to fill a certain sheet of paper, or are you looking to do this for a certain period of time? Or do you want to record a certain number of breaths? What’s the limiting factor? JO: It’s a process that requires a commitment to filling a large piece of paper with tiny marks. It is sometimes difficult to begin, but once I have, I enjoy watching it evolve. There are no time constraints. RN: What sorts of material preparations do you have to make? Do you go out and buy a load of pencils? Do you work on the floor or on the wall? JO: I have hundreds of pencils, as you can imagine. I always work on the wall, and I adjust the position of the paper so that the marks I’m making are at eye level. RN: That’s really interesting. So you’re not experiencing drastically different body positions while you’re working on the drawing? JO: I focus on my breathing, and to do that I’ve found that my body has to be in a somewhat meditative mode. RN: Does the process ever become exhausting, or do you always feel that it’s calming? JO: I’ve always been drawn to repetition as an indicator of commitment and endurance. The Breaths drawings are as much about endurance as they are about meditation. Sometimes they are almost impossible to finish because they require such focus. I’m adamant about not just sitting there, making marks. Each mark really has to correlate to one breath, or the drawings don’t work. RN: So they’re very honest drawings. JO: Yes, they’re honest. That’s what gives the drawings their integrity. Play to hear Jill O’Bryan discussing presence, rhythm, and archiving. Play to hear Jill O’Bryan discussing the meditative process of her work. Play to hear Jill O’Bryan discussing breath. Jill O’Bryan (b. 1956, Chicago, IL) received her BA from Macalester College, St. Paul, Minnesota (1978) and her MFA from the San Francisco Art Institute, California (1990). She completed her PhD in the Department of Art and Art Professions at New York University, New York in 2000. O’Bryan was one of the first recipients of the Marie Walsh Sharpe Space Program Fellowship (1991-1992). She was a Graduate Assistant at New York University (1993-1995), and while there she received several New York University Graduate Students Organization Travel Grants (1997, 1998, 2000). 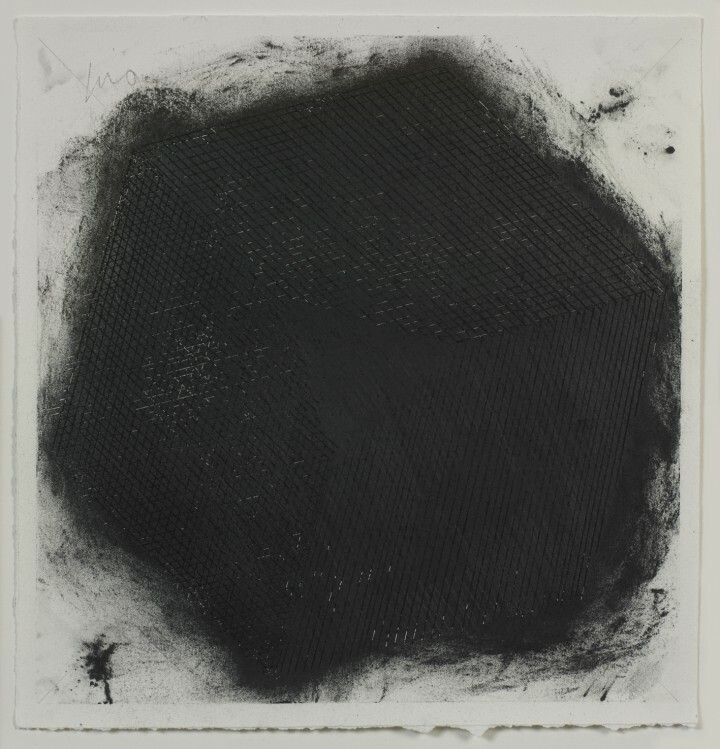 Her work was most recently seen in a solo show at Gallery Joe, Philadelphia (2012), and group shows at Museo de Arte Contemporáneo Esteban Vicente, Segovia, Spain (2009); Gallery Joe, Philadelphia (2010); Katonah Museum of Art, Katonah, New York (2011); Danese Gallery, New York (2011); Zimmerli Art Museum, Rutgers University, New Brunswick, New Jersey (2012); and University of Richmond Museums, Richmond, Virginia (2012). O’Bryan is also active as a writer. She lives and works in New York City and Las Vegas, NM. Rachel Nackman: Each of these drawings was made through very heavy surface application of graphite onto paper, incised with a series of lines that define a dimensional object. 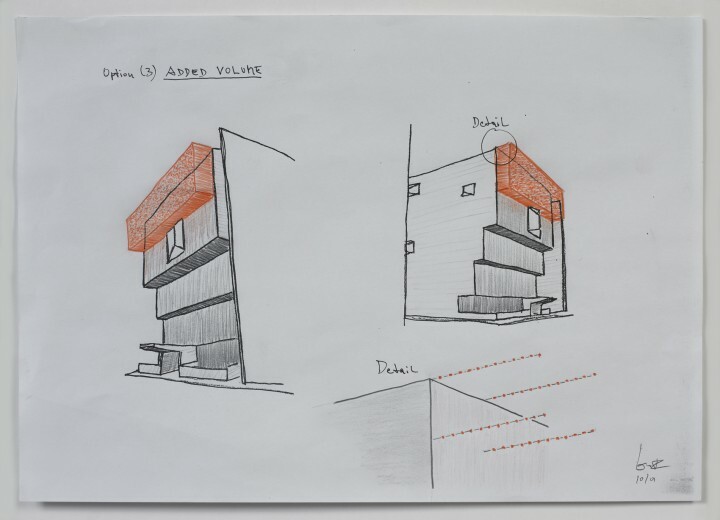 Can you tell us more about making these drawings and the materials you used? 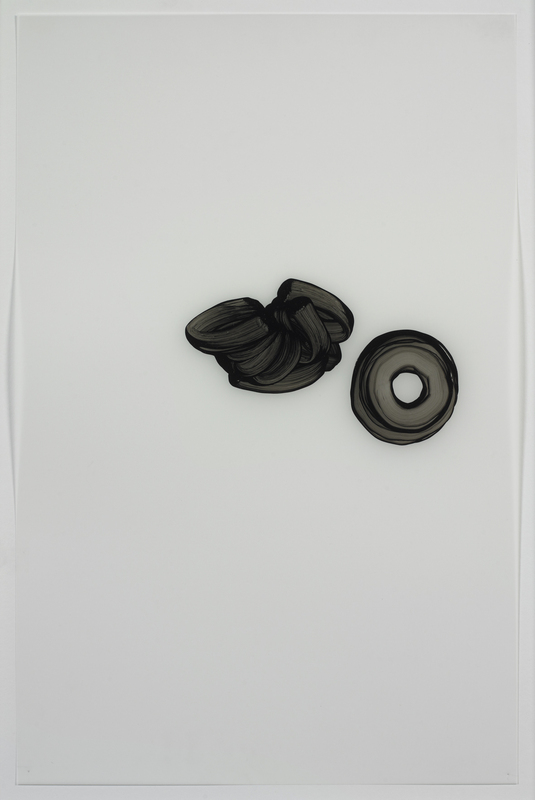 Kristin Holder: First, I taped off the edges of the paper. I found the center of the sheet using a pencil. I constructed a cube within the taped edges. I incised lines into the paper using a burin, a tool for printmaking; those lines define the sides of the polyhedron. Then I rubbed on the powdered graphite with my hand. I used a good deal of powdered graphite in order to try to fill in all the troughs in the drawing. The graphite is just like baby powder; it goes everywhere. That’s why it extends beyond the edges of the incised lines. RN: How did you construct this polyhedron shape? KH: I used really simple geometry. I found the center of the sheet by drawing straight lines from opposing corners and making an X. Then I built out from that center point. For these drawings, I tried to eyeball it. I drew a circle using a compass, I made a hexagon within the circle, and then I drew a cube from the hexagon. Then I started slicing off corners in order to approach the shape that’s in Albrecht Dürer’s print Melencolia I (1514). RN: The drawings are both titled Heavy Thinking. You made a wall drawing in 2007 with the same title. Can you tell us how, if at all, the wall drawing relates to the drawing? KH: These drawings aren’t related to the wall drawing as preparatory drawings. They’re not related in terms of scale either. The only similarity is in the medium. Both works are made with graphite, and they’re both rubbed onto their support. The idea for both also comes from that print by Dürer, in which a polyhedron plays a significant role. The print is kind of a warning to artists not to let their practice fall too much on the side of the intellectual. I decided to pull that polyhedron form from Dürer’s print and start working with it as a warning to myself. Don’t overthink. Don’t become too involved in the intellectual side of things. Try to make sure there is a balance between your appreciation of a drawing as you make it and the physical properties that come out of making, which are more in the realm of beauty and the spiritual. I’ve drawn the shape from two different perspectives. His View (fig. 1) is the artist’s view of the shape as you look at it in Dürer’s print. Her View (fig. 2) shows the object rotated ninety degrees—from the muse’s point of view. RN: Is there a reason why that polyhedron in particular catches your eye? KH: Before I was working on these drawings, I was thinking about fractals a lot, and I was making some other wall drawings. One of those wall drawings was based on a fractal form—a kind of a branch shape. I had made a stencil out of the branch shape, and I used it to create a larger form that looked kind of like a feather or a tree—just by repeating this shape and following a very mathematical way of growing it. Occasionally I get overly engrossed in the mental intricacies of an idea and go too far with it. After seeing the Dürer print, I kept thinking about that polyhedron. I couldn’t figure out what it was—or where it derived from in the first place. So I started drawing it to try to figure it out. I determined that it was a cube, and it took off from that earlier idea of studying the cubic fractal. RN: Can you provide a basic overview of fractals? KH: A fractal is a mathematical construct. It is a way of studying forms that look the same whether you’re viewing them from a 1x magnification or a 1000x magnification. Fractals are used to study clouds, trees, river tributaries, coastlines—things to which you wouldn’t think you could apply a mathematical formula. These drawings are in no way representations of a fractal, but that was a jumping-off point. It’s hard for me to say that drawing a cube would be intuitive, but the cubes in His View and Her View are intuitively made. I eyeball a lot of it. I use a really simple way of finding the center of the drawing, using and making tools, and then rubbing. So there’s not a lot of math involved. There’s no form that can’t be intuitive. I think that’s a frame of mind. RN: And these drawings are an exercise in that frame of mind? KH: Yes. It was something I set out to change in myself. In these drawings, I think I needed the progression and the steps. I think that being physically involved in the making, letting it become more of an intuitive process, has been really healthy for me. RN: In a statement that you wrote in 2007 about your wall drawing Heavy Thinking, you mentioned that you made the work in two phases: the first phase was concerned with line, and the second, with mass. Was there a similar distinction in making these drawings? KH: Not so much. When I was making the wall drawing, the line was set up purely for me to fill in—in order to draw an object that is to scale. Making the wall drawing was extremely enjoyable because I was working freehand on a twenty-foot wall—so the line had a lot of give and play, and I reacted to myself trying to keep it straight. It shows in the final drawing that line and mass are really separate, because the graphite area is hard-edged, heavy, matte, and the line drawing is erratic—it has a whole different quality. In the works on paper, line and mass are intertwined. I see the incised lines as part of the drawing. Each line becomes a cavity to hold the graphite, and there’s no separating them for me. RN: We’ve talked about the Dürer print quite a bit, but you’ve also spent some time at the National Gallery of Art in Washington, DC, installing Sol LeWitt wall drawings. Did that experience, or your experience with LeWitt in general, have any bearing on these drawings? 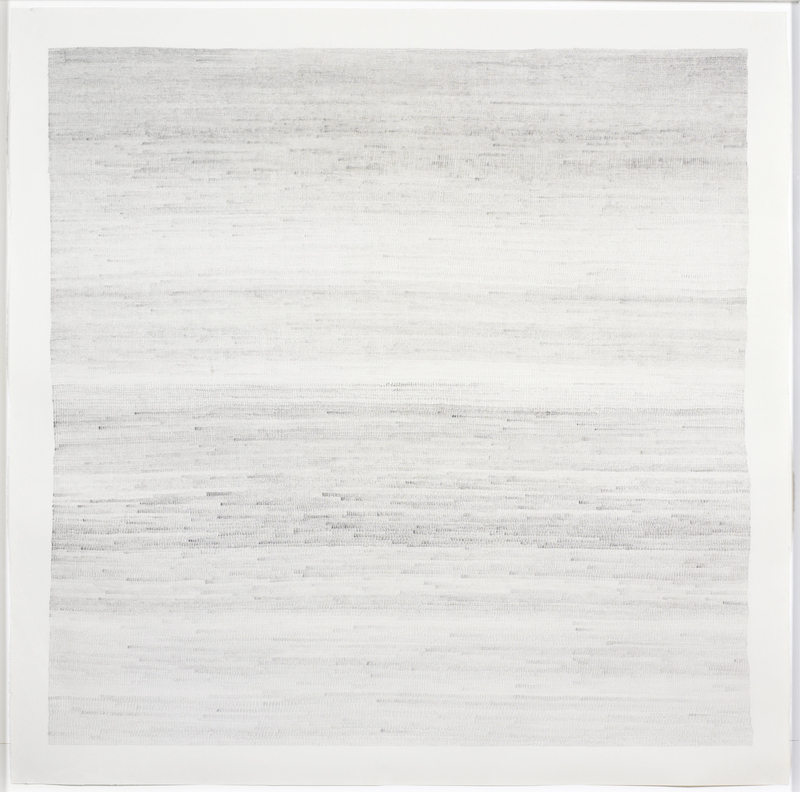 KH: I think the most direct correlation between these drawings and LeWitt’s wall drawings would be the sound of making these drawings. When I made a LeWitt wall drawing, it was a noisy, repetitive movement, done with lead pencils on a bumpy wall. You could hear the sounds of the pencil, and that made a lasting impression. When I am making my drawings, there is a similar kind of grating sound, especially when I am incising the lines, because my burin tears at the paper a little bit. I think the similarity of sound is the most pertinent relationship here. But I don’t think there’s any way that I could really extract the legacy of Sol LeWitt from my work—split it into pieces or parts that are particularly relevant. I think his work is a visual language that’s part of me. RN: You also spent some time working in conservation at the National Gallery, which must have given you an understanding of materials, beyond just how they’re used. KH: Yes, it did. The benefit to me from working in conservation lay in seeing all the underdrawings beneath paintings. I was interested in unraveling the processes of other artists. Artists use their materials with a great deal of respect. They may have a lot of expectations for the materials, and they may not understand the chemistry behind them, but they make it work. RN: From one angle, these drawings were an intellectual project, through which you were changing the way that you approach making work. But was this also a material project? Was this in part an effort to get to know something about graphite, something that you didn’t already know? KH: I think a lot of great work is made when the artist is working with materials that he or she doesn’t know. As you work, you push your materials farther and farther, but you don’t ask them to do more than they can. I have some understanding of what graphite can do. What I want it to do is stick to the paper, and that’s about as complicated as the question gets. So I use a burin to try to make a place for the graphite to stick to the paper. Step by step. I wasn’t trying to find out something new about what graphite can do. I didn’t set out to do it, but along the way I did. Kristin Holder (b. 1973) earned her BA in Interdisciplinary Visual Art and her BFA in Painting from the University of Washington in Seattle in 1996. She earned her MFA from American University in Washington, DC in 1999. 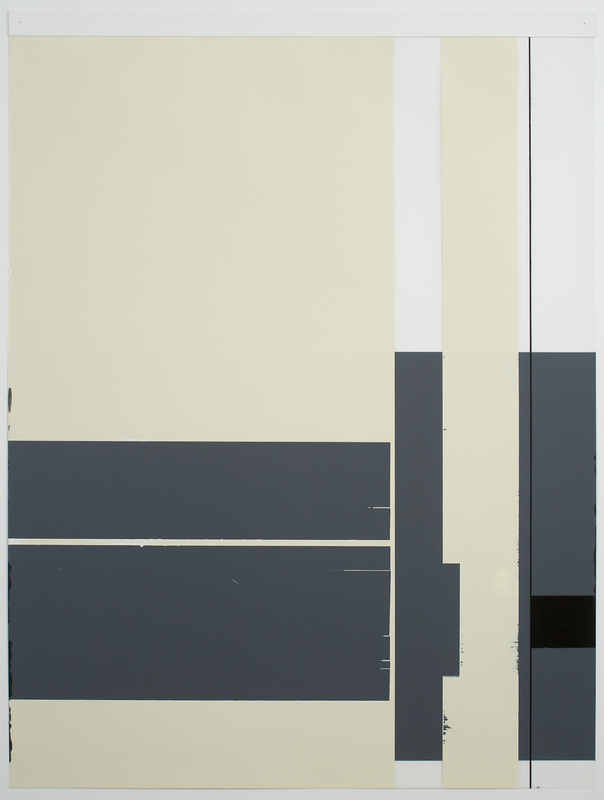 Holder’s most recent solo exhibitions have been held at The Gallery of Alex Lake, Dover, New Hampshire (2006); Warehouse, Washington, DC (2007); and Gallery Joe, Philadelphia (2009). Her most recent group exhibitions have been held at Museo de Contemporáneo Esteban Vicente, Segovia, Spain (2009); Gallery Joe, Philadelphia (2011); and the Katonah Museum of Art, Katonah, New York (2011).